Remember when I saw the press premiere of Glee 3D? Well, right after the movie I rushed to Forever 21 to get some of their make-up brushes. Forever 21 Philippines did not carry the Forever 21 cosmetics line before soooo when I found out they finally do, I just had to get a glimpse (hold) of some of the products. I have yet tried their make-up and the Forever 21 branch at Megamall does not have testers weird so I dare not buy the make-up--also because I have bad experiences with non-make-up companies trying their take on cosmetics. However, brushes are a different hot topic. Because their brushes are darn cute, I decided to try my luck on them. I got the set with the golden handle because my main purpose for getting the set aka. ulterior motive is to source a brush set for our store. Since the golden one was the most discreet, I decided to take them instead of the bejewelled sets, etc. I also got one powder brush (metallic pink on the left) because the brushes on the golden set were limited. The powder brush in the set seemed too small--almost like a blush brush only--and I needed a "dedicated" powder brush for our make-up testers. 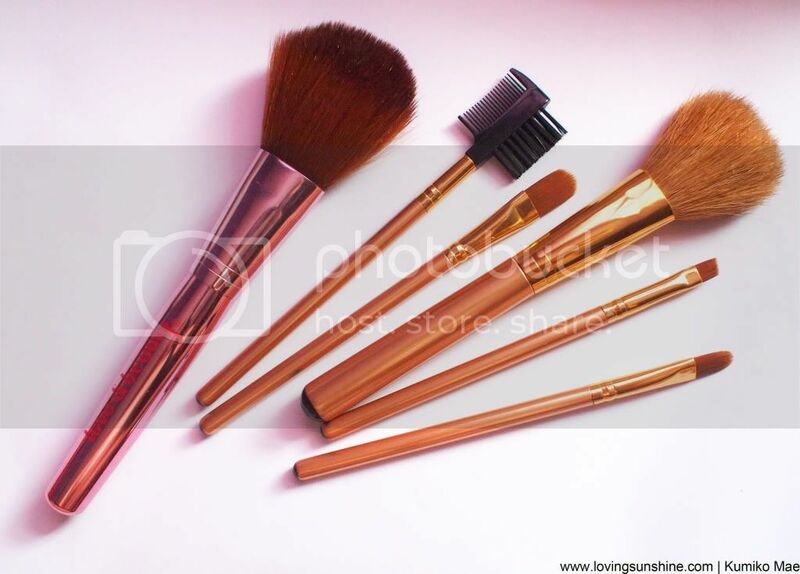 Gosh I can't recall the price, but I'm trying my luck here, the powder brush (metallic pink) is approx Php 250 and the golden set (5-brushes) is approx Php 350. The five brush set includes a powder/blush brush, eyeshadow brush, eyebrow comb/brush, eyeliner brush and lip brush. Is the golden brush set worth it... not so. If you're a collector (young collector) maybe you'd be attracted by their cute colors but for make-up us, the brushes are well so-so. They're just really nice to look at. I don't like how light they are. They weigh like plastic toys--which is a bit difficult to work with ESPECIALLY if you're heavy-handed. The powder brush on the other hand pleased me. It's soft, still very toy-like but at least it gives relatively proper powder brush performance. Plus anything metallic pink captures my heart. But I'd be happy to get them as gifts! Cause like I said, they're super cute. Aww.. love and beauty... pretty much what I stand for in life (especially in this blog). So... what's next from K? more brushes.... just wait for it!